Istanbul (/ˌɪstænˈbʊl, ˌɪstɑːn-, -ˈbuːl/, also US: /ˌɪstən-, ˈɪstənbʊl, -buːl, ɪˈstɑːnbʊl/; Turkish: İstanbul [isˈtanbuɫ] ( listen)), formerly known as Byzantium and Constantinople, is the most populous city in Turkey and the country's economic, cultural and historic center. Istanbul is a transcontinental city in Eurasia, straddling the Bosporus strait (which separates Europe and Asia) between the Sea of Marmara and the Black Sea. Its commercial and historical center lies on the European side and about a third of its population lives in suburbs on the Asian side of the Bosporus. With a total population of around 15 million residents in its metropolitan area, Istanbul is one of the world's most populous cities, ranking as the world's fourth largest city proper and the largest European city. 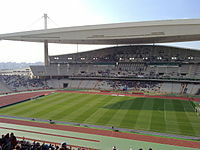 The city is the administrative center of the Istanbul Metropolitan Municipality (coterminous with Istanbul Province). 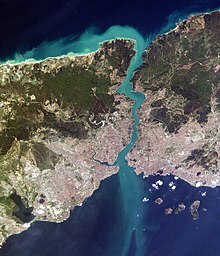 Istanbul is viewed as a bridge between the East and West. Global warming in Turkey may cause more urban heatwaves, droughts, storms, and flooding. Sea level rise is forecast to affect city infrastructure, for example Kadıkoy metro station is threatened with flooding.Xeriscaping of green spaces has been suggested, and Istanbul has a climate change action plan. 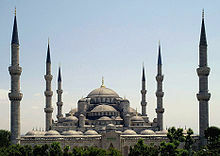 Politically, Istanbul is seen as the most important administrative region in Turkey. Many politicians, including the current President Recep Tayyip Erdoğan, are of the view that a political party's performance in Istanbul is more significant than it's general performance overall. 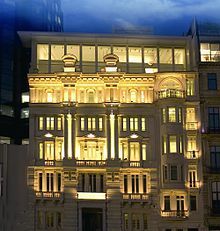 This is due to the city's role as Turkey's financial centre, its large electorate and the fact that Erdoğan himself was elected Mayor of Istanbul in 1994. In the run-up to local elections in 2019, Erdoğan claimed 'if we fail in Istanbul, we will fail in Turkey'. 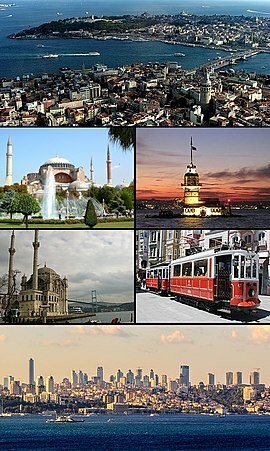 Historically, Istanbul has voted for the winning party in general elections since 1995. Since 2002, the right-wing Justice and Development Party (AKP) has won pluralities in every general election, with 41.74% of the vote in the most recent parliamentary election on 24 June 2018. Erdoğan, the AKP's presidential candidate, received exactly 50.0% of the vote in the presidential election held on the same day. Starting with Erdoğan in 1994, Istanbul has had a conservative mayor for 25 years, until 2019. The second largest party in Istanbul is the centre-left Republican People's Party (CHP), which is also the country's main opposition. The left-wing pro-Kurdish Peoples' Democratic Party (HDP) is the city's third largest political force due to a substantial number of Kurdish people migrating from south-eastern Turkey. More recently, Istanbul and many of Turkey's metropolitan cities are following a trend away from the government and their right-wing ideology. In 2013 and 2014, large-scale anti-AKP government protests began in İstanbul and spread throughout the nation. This trend first became evident electorally in the 2014 mayoral election where the centre-left opposition candidate won an impressive 40% of the vote, despite not winning. The first government defeat in Istanbul occurred in the 2017 constitutional referendum, where Istanbul voted 'No' by 51.4% to 48.6%. The AKP government had supported a 'Yes' vote and won the vote nationally due to high support in rural parts of the country. The biggest defeat for the government came in the 2019 local elections, where their candidate for Mayor, former Prime Minister Binali Yıldırım, was defeated by a very narrow margin by the opposition candidate Ekrem İmamoğlu. İmamoğlu won the vote with 48.77% of the vote, against Yıldırım's 48.61%. Similar trends and electoral successes for the opposition were also replicated in Ankara, Izmir, Antalya, Mersin, Adana and other metropolitan areas of Turkey. Administratively, Istanbul is divided into 39 districts, more than any other province in Turkey. As a province, Istanbul sends 98 Members of Parliament to the Grand National Assembly of Turkey, which has a total of 600 seats. 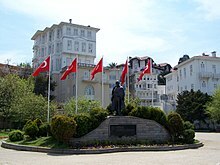 For the purpose of parliamentary elections, Istanbul is divided into three electoral districts; two on the European side and one on the Asian side, electing 28, 35 and 35 MPs respectively. 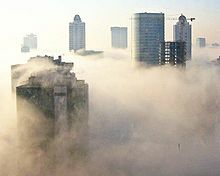 Air pollution in Turkey is particularly severe in İstanbul with cars causing frequent urban smog, as it is one of the few European cities without a low-emission zone. As of 2019[update] measured with the air quality index Istanbul's air affects the hearts and respiratory systems even of healthy individuals during busy traffic. ^ Mango, Cyril (1991). "Constantinople". In Kazhdan, Alexander (ed.). The Oxford Dictionary of Byzantium. Oxford and New York: Oxford University Press. pp. 508–512. ISBN 0-19-504652-8. ^ "İstanbul İklim Değişikliği Eylem Planı". Retrieved 22 April 2019. ^ Hensel, Michael; Sungurogl, Defne; Ertaş, Hülya, eds. (January – February 2010). "Turkey at the Threshold". Architectural Design. London. 80 (1). ISBN 978-0-470-74319-5. ^ "Fed up with Istanbul traffic". Retrieved 28 September 2018. ^ "Understanding Vehicular Pollution – AQI, Harmful Effects and How to Reduce It?". News18. 1 March 2019. ʻAner, Nadav (2005). Pergola, Sergio Della; Gilboa, Amos; Ṭal, Rami (eds.). The Jewish People Policy Planning Institute Planning Assessment, 2004–2005: The Jewish People Between Thriving and Decline. Jerusalem: Gefen Publishing House Ltd. ISBN 978-965-229-346-6. Baynes, Norman H. (1949). Baynes, Norman H.; Moss, Henry S.L.B (eds.). 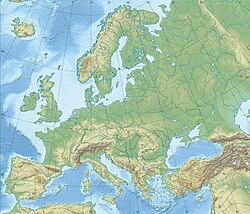 Byzantium: An Introduction to East Roman Civilization. Oxford: Clarendon Press. ISBN 978-0-674-16531-1. De Sélincourt, Aubery (2003). Marincola, John M. (ed.). The Histories. Penguin Classics. London: Penguin Books. ISBN 978-0-14-044908-2. Efe, Recep; Cürebal, Isa (2011). "Impacts of the "Marmaray" Project (Bosphorus Tube Crossing, Tunnels, and Stations) on Transportation and Urban Environment in Istanbul". In Brunn, Stanley D (ed.). Engineering Earth: The Impacts of Megaengineering Projects. London & New York: Springer. pp. 715–34. ISBN 978-90-481-9919-8. Köse, Yavuz (2009). "Vertical Bazaars of Modernity: Western Department Stores and Their Staff in Istanbul (1889–1921)". In Atabaki, Touraj; Brockett, Gavin (eds.). Ottoman and Republican Turkish Labour History. Cambridge: Cambridge University Press. pp. 91–114. ISBN 978-0-521-12805-6. Necipoğlu, Gülru (2010). "From Byzantine Constantinople to Ottoman Kostantiniyye". In ölcer, Nazan (ed.). From Byzantion to Istanbul. Istanbul: SSM. ISBN 978-605-4348-04-6. Reinert, Stephen W. (2002). "Fragmentation (1204–1453)". In Mango, Cyril (ed.). The Oxford History of Byzantium. Oxford: Oxford University Press. ISBN 978-0-19-814098-6. Sanal, Aslihan (2011). Fischer, Michael M.J.; Dumit, Joseph (eds.). New Organs Within Us: Transplants and the Moral Economy. Experimental Futures (illustrated ed.). Chapel Hill, NC: Duke University Press. ISBN 978-0-8223-4912-9. Tigrek, Sahnaz; Kibaroğlu, Ayșegül (2011). "Strategic Role of Water Resources for Turkey". In Kibaroğlu, Ayșegül; Scheumann, Waltina; Kramer, Annika (eds.). Turkey's Water Policy: National Frameworks and International Cooperation. London & New York: Springer. ISBN 978-3-642-19635-5. Turan, Neyran (2010). "Towards an Ecological Urbanism for Istanbul". In Sorensen, André; Okata, Junichiro (eds.). Megacities: Urban Form, Governance, and Sustainability. Library for Sustainable Urban Regeneration. London & New York: Springer. pp. 223–42. ISBN 978-4-431-99266-0. Wedel, Heidi (2000). Ibrahim, Ferhad; Gürbey, Gülistan (eds.). The Kurdish Conflict in Turkey. Berlin: LIT Verlag Münster. pp. 181–93. ISBN 978-3-8258-4744-9.